No Dental Insurance? See Our Concierge Plan Options Below. NO SETUP COSTS AND NO ANNUAL MAXIMUMS! You may complete the enrollment process in the office, before an appointment. Book your appointment by clicking here or by calling/texting us at (510) 482-5300. Please make sure to arrive 15 minutes before your appointment time to do so. STEP 1: Complete your online enrollment by Clicking Here. Once your enrollment form is received and processed (within 1 business day), we will confirm your status as a Concierge patient with you. STEP 2: Book your first appointment by Clicking Here. You don't have to wait to receive confirmation of your Concierge enrollment to book your appointment. Once your enrollment is processed, you will be marked as a Concierge patient in our system. *Plans require a 12-month commitment. The denoted discounts for each plan are given off of the Practice’s Usual and Customary and Reasonable (UCR) fee schedule. ‘All Other Care’ includes all care that is non-cosmetic and not related to orthodontics (Invisalign) or implant procedures. **Family includes the Patient, the Patient’s spouse or domestic partner and up to two (2) minors. 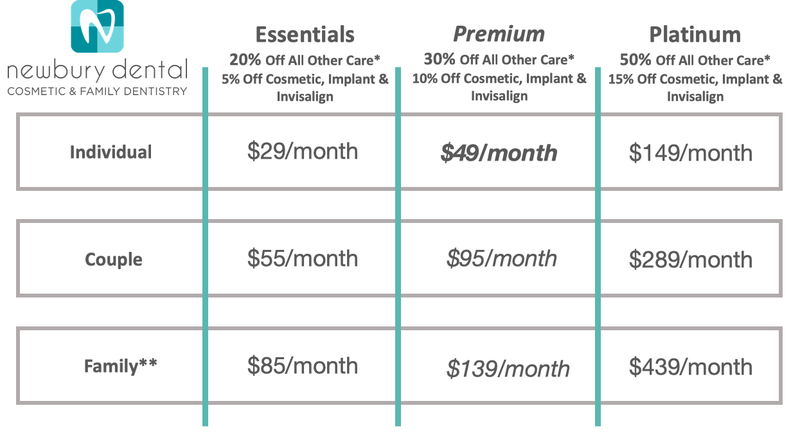 Concierge plans are only applicable for services provided at Newbury Dental in Oakland. These plans are not considered insurance plans. For more information, please call (510) 482-5300.